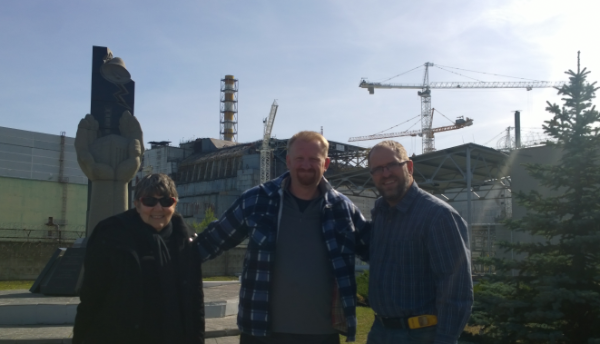 Chernobyl Tour: Nuclear Disaster Day Trip – Traveling Epic! 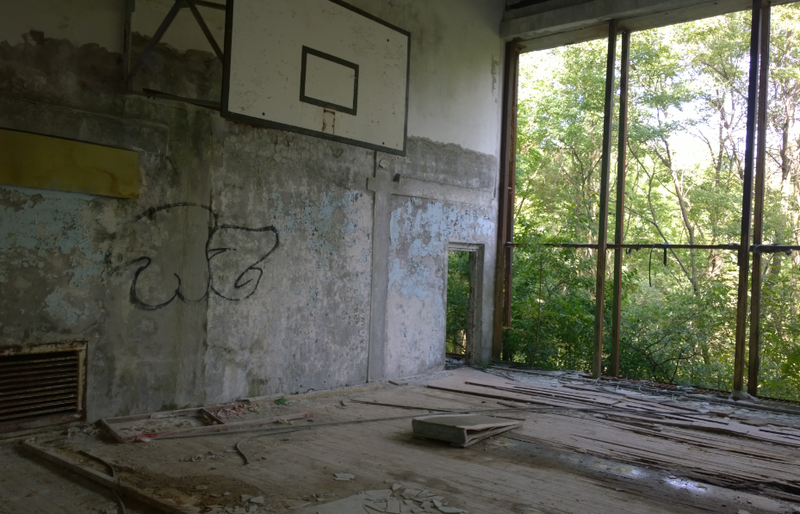 My first experience with Chernobyl was a fly over. 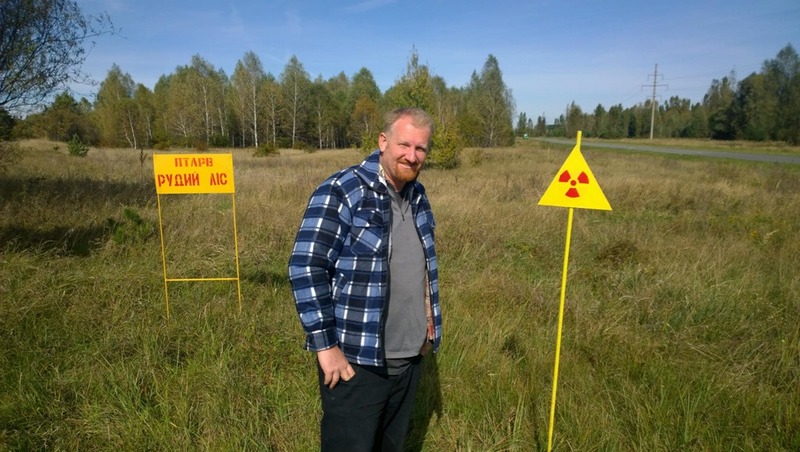 I was flying out of Belarus to Ukraine and my friend Michael mentioned we were flying over the area where Chernobyl happened. My curiosity and thoughts went wild. Then it was a couple of b movies, TV show, and Hollywood Horror Flick that really got me interested. 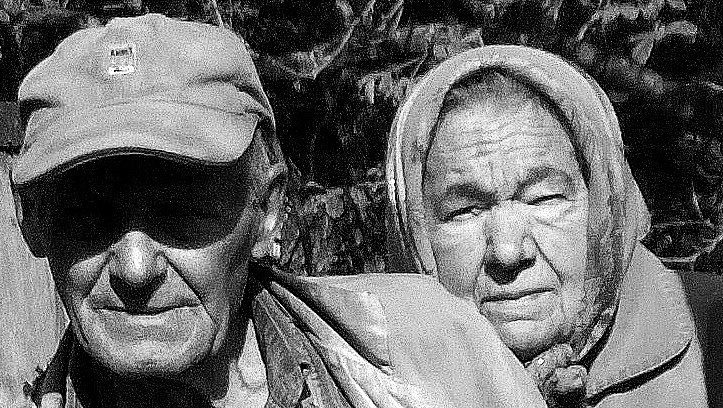 An article from national geographic about the people that lived in the exclusion zone really got me curious. чернобыль to locals in Ukraine isn’t a place people would want to visit? Why go to a contaminated place? Have you ever been curious to visit a place after a volcano? Mt St Helens… A hurricane? 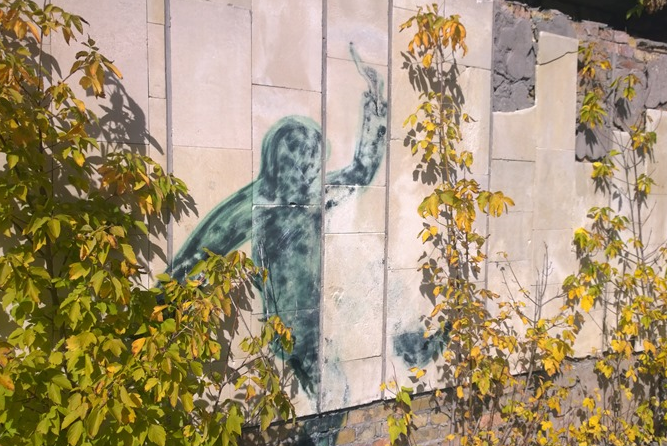 New Orleans… or curious about Berlin? Why not Hiroshima or Chernobyl? There is actually a name for this now. Disaster Tourism – the act of traveling to a disaster area as a matter of curiosity. Was it possible to visit such a place? These rides were never enjoyed by children. The city was evacuated before the park’s launch at the May day celebration. So I tried to track down a tour that would be able to pick me up on the day the only day I was going to be available. Thursday Sep 25. Here’s the confirmation mail from my reservation that shares a lot of the details. We reserved the private tour. This gave us more flexibility. We stopped at a market on the way and I got a jacket and locally made yoghurt (it had been pretty cold. 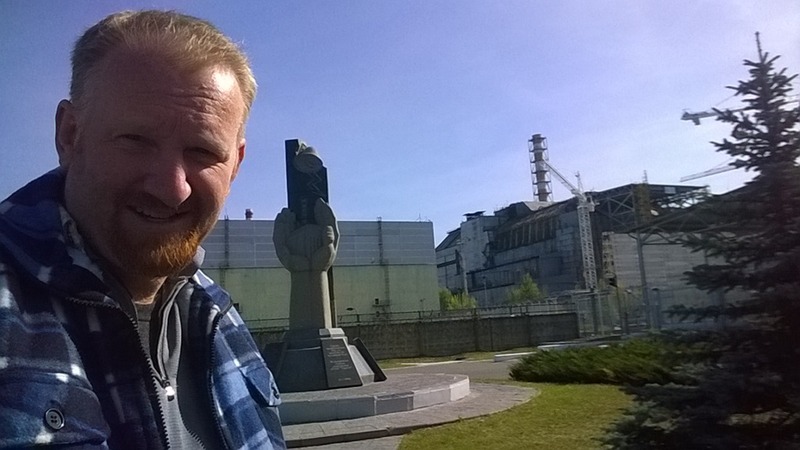 In front of the Chernobyl Nuclear Disaster monument. Behind us is Nuclear reactor #4. It’s been covered by what they call a sarcophagus and they are in the process of building the new one which is the biggest engineering project of this kind. This New York Times article describes the new construction. Make sure to carry your passport with you on the day of your tour. The Dnipro Hotel is situated in the Сentre of the city, on the European Square. AS SOON AS you check-in at your hotel in Kiev, call a taxi service and arrange for a cab pick-up in the morning, for example, at 8:00 a.m. or so -the taxi people will be able to give you a more accurate estimate. Normally, there is a HEAVY TRAFFIC in this part of the city at this time of the day. You will have to pay it in UA Hr though. Unfortunately, the UA Hr exchange rate fluctuates these days pretty vigorously. If it was today, it would be an equivalent of 4405 (four thousands four hundred five) Ukrainian Hryvna. However for now this is just a reference point for you, while the exact amount will be confirmed by the tour manager on the day of your tour, as you come to board your tour vehicle. You will have to pay this amount in Ukrainian currency. 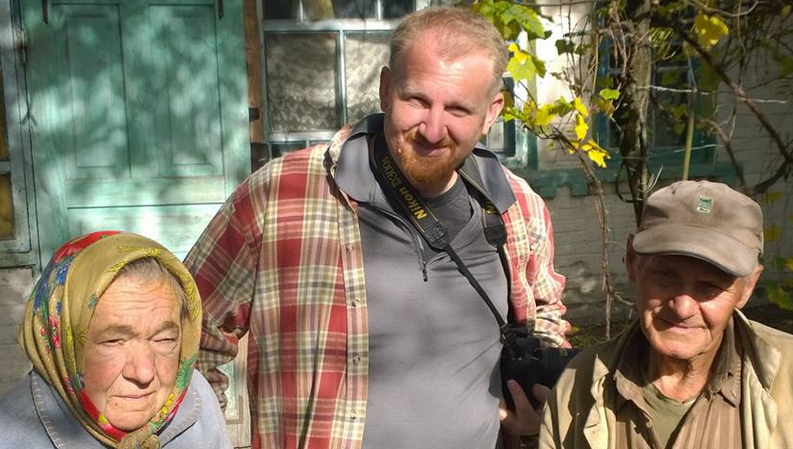 Please mind, the tour manager will not accept currencies other than Ukrainian Hryvna. It’s not uncommon to experience problems with obtaining cash from Mastercard, Visa and other credit/debit cards at ATMs in Kiev, Ukraine. We strongly recommend that you bring some Euro and/or US$ cash with you to avoid possible unpleasant last-minute surprises. Please make sure to wear a close type of clothing: long sleeves, no shorts, close sports or casual type footwear (no flip-plops, no sandals). Radiation dosimeters are available for rent. The daily rental rate is 200UAHr/day (equivalent of 13Euro). Please indicate explicitly the number of dosimeters you wish us to reserve for your. Please confirm receiving this email. 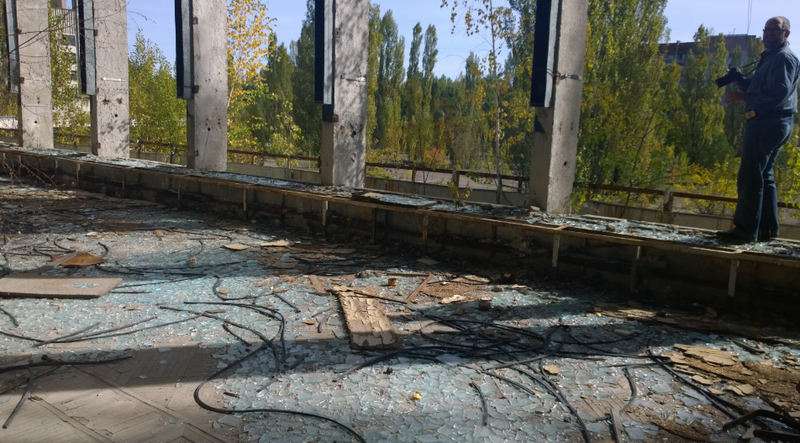 Life in Pripyat came to a shuddering end on April 26, 1986, less than two miles (less than three kilometers) south of what was then a city of 50,000, as the Chernobyl Nuclear Power Plant’s number four reactor exploded. Thirty people died in the blast and fire or exposed to lethal doses of radiation. The destroyed hulk burned for ten days, contaminating tens of thousands of square miles in northern Ukraine, southern Belarus, and Russia’s Bryansk region. It still is the worst nuclear accident the world has ever seen! An exclusion zone of about 1,000 square miles still exists around the plant, with access controlled through checkpoints. 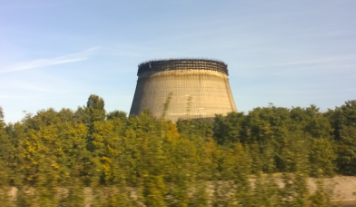 Although radiation levels have declined somewhat through the natural process of radioactive decay, the zone remains virtually empty. Some of the villages were bulldozed to contain the radiation (it didn’t help); forest has overtaken others. 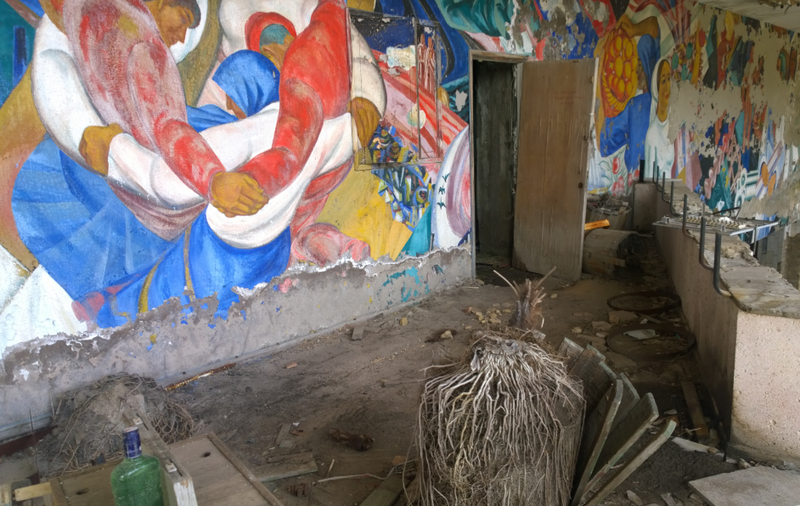 In Pripyat, where 45,000 people once lived, paint peels off the murals in the community center and a tree grows in the middle of a gym floor. In one apartment, all that remains is a smashed piano. The fallout, 400 times more radioactivity than was released at Hiroshima, drove a third of a million people from their homes and triggered an epidemic of thyroid cancer in children. Over the years, the economic losses—health and cleanup costs, compensation, lost productivity—have mounted into the hundreds of billions of dollars. Unscheduled stop. Saw some places in the woods and asked top stop. 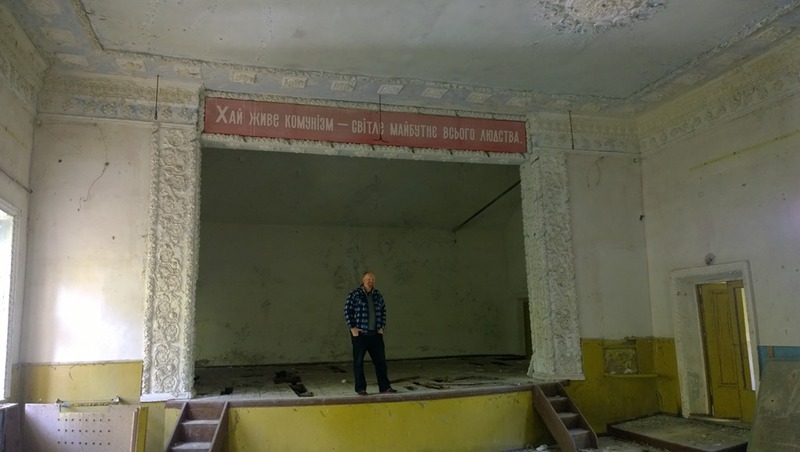 This was a community center complete with stage. 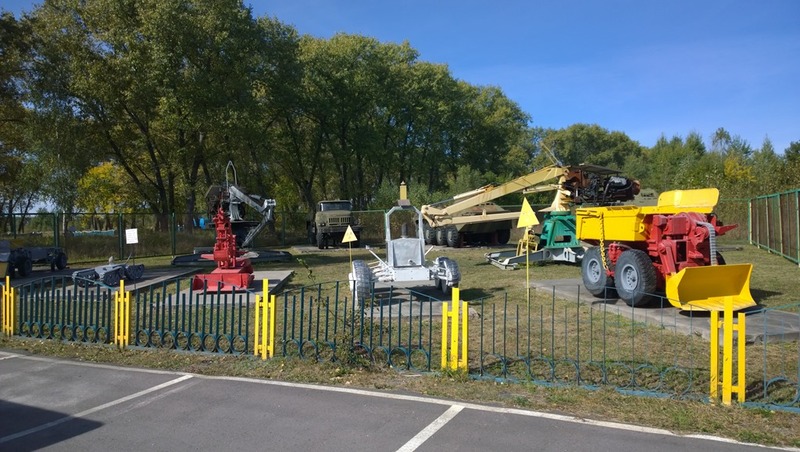 These are the robots that were used to clean up the nuclear disaster. The best ones were the ones without electrical components. 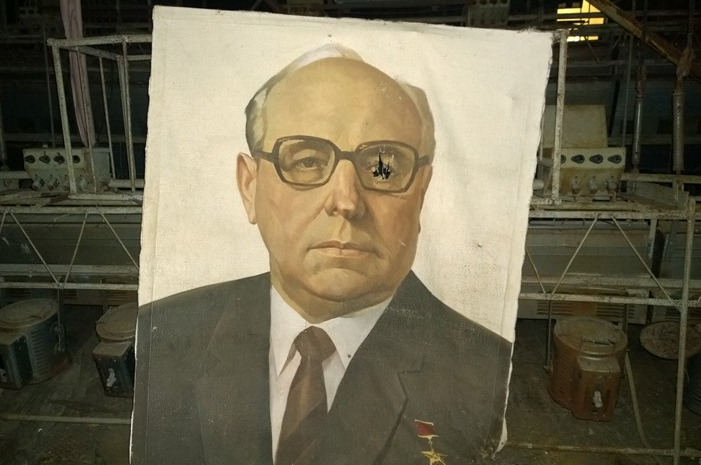 The best ones apparently were the old soviet ones. 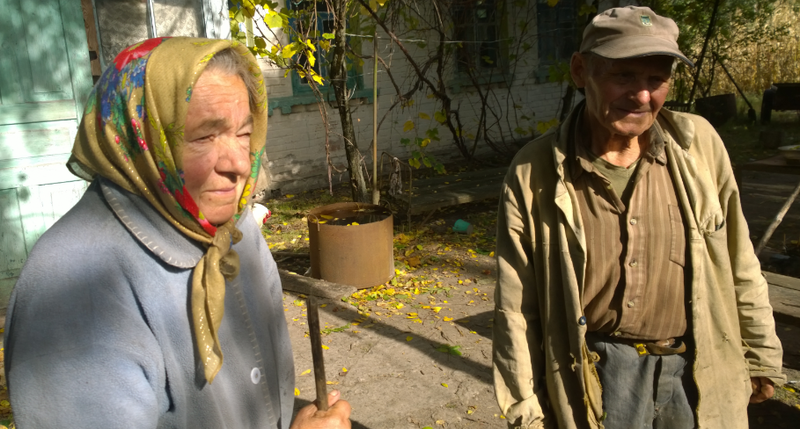 Transfer to the village of Leliyov. Passing the 10-km zone border. 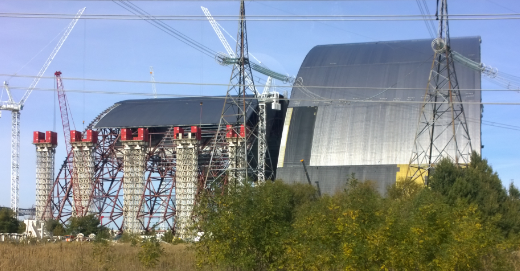 Transfer to the Chernobyl Nuclear Power Station and sightseeing of Reactor 4. The Fish of the cooling water. These are nuclear hot. Reminds me of the Simpsons fish what you can’t see in the picture is the scale. 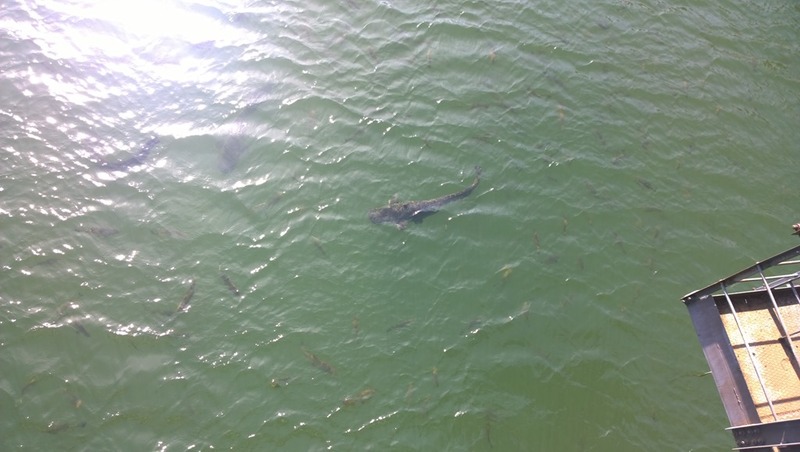 The catfish is so big it is the size of a shark. They often will feed it a loaf of bread! 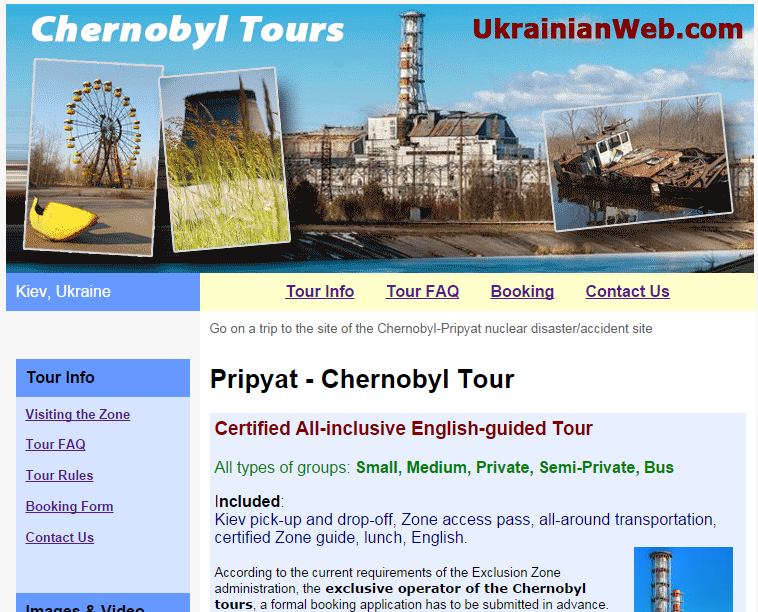 Visit to Pripyat (Prypiat), the highlight of your trip. 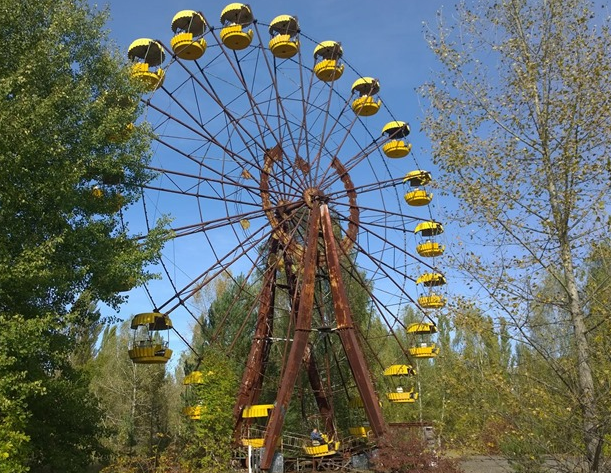 Sightseeing of “The Dead (Ghost) Town” – swimming pool area, ferris wheel, amusement park, river boats, abandoned buildings, school, etc..
Watch my video “Stroll through Pripyat” where you can see the natural surroundings. A customized (private) trip; 2 day trip is available too. There is some pretty strange graffiti, maybe this is from one of those scary movies? Large strange poster inside the hotel. 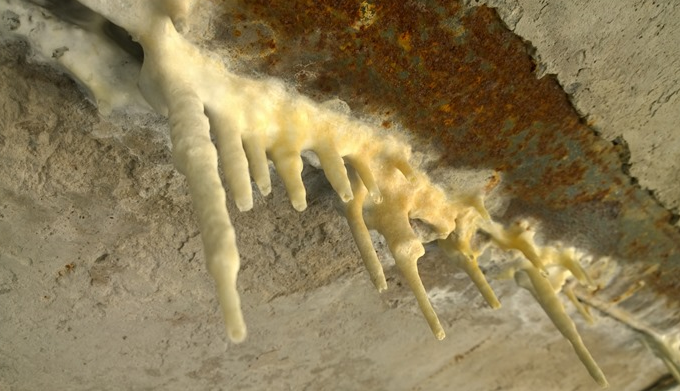 How long does it take to grow stalactites? Well as the large hotel turns into a cave, maybe 30 years? Near the Red Forest we stopped by this sign. I didn’t really take any pictures of our basic lunch. We all laughed about the apples. The soup was fine. 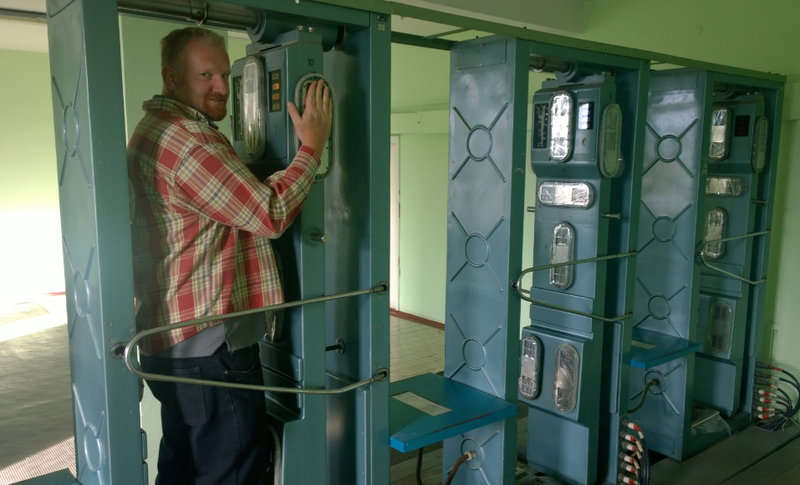 Visit to Chernobyl Scientific Center: physical and radiochemical laboratories (optional). Visiting the Opachychi village, meeting with “re-settlers”, people who have moved back to their villages after evacuation (optional). Passage through the Dytyatky check-point. Checking the radiation, deactivation. After 2 checks like the above at each of the checkpoints. Return to Kiev at around 6 p.m.
We still got rid of our clothes and shoes and took a detox shower. Incredible amazing tour. All those comments make sense now. 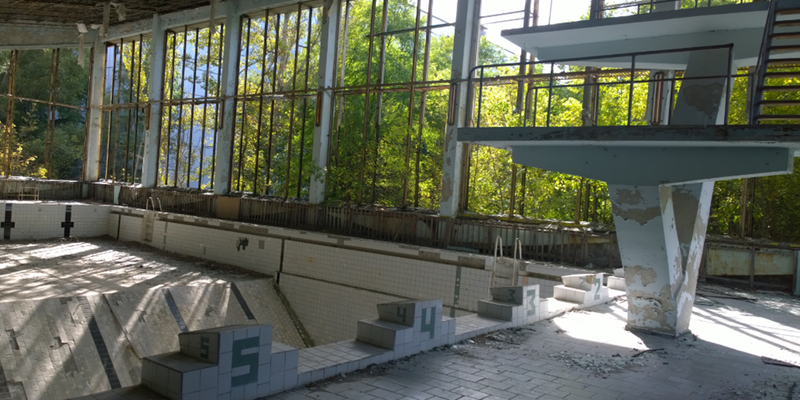 Chernobyl was amazing as a ghost town, a wasteland, and unlike anywhere in the world due to its size and culture. One of the most interesting thing was listening to the real survivors. And all this while i thought it was just a location for horror movie. It is haunted and have zombie dog. (* reference to movie : Chernobyl Diaries) . Hihi..i know..i know it is just a movie..but u can’t helped but wonder😂. Anyway, thank you for sharing . It was really detailed write up and i enjoyed every moment of it. Glad you enjoyed it! I’m sure it is haunted, and the wolves became such a problem the old timers told us they did have to come and get rid of some of them because there were so many wolves. They had surrounded the small village.